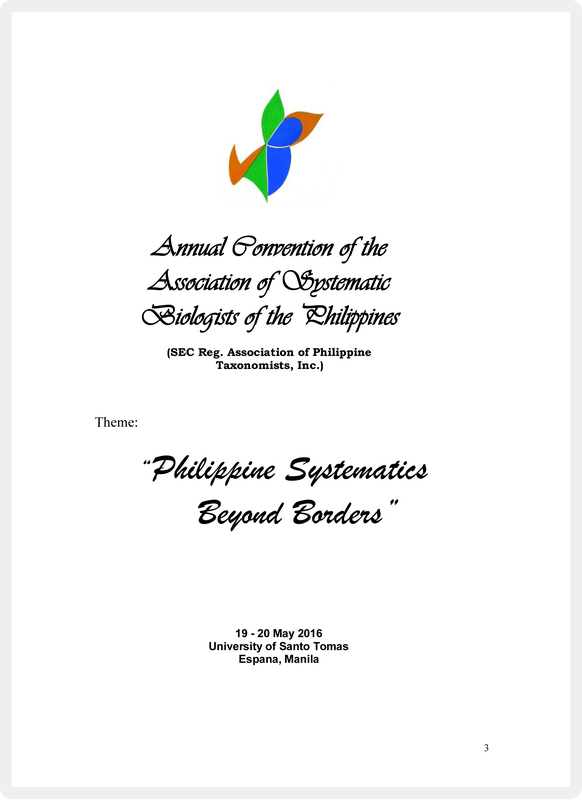 The Association of Systematic Biologists of the Philippines was revived during the Annual Meeting held at the Philippine National Museum last 31 May 2003. In the meeting the participants referred to the ASBP constitution for guidance in election of officers, financial matters, the reactivation of the Systematic Biologists of the Philippines Foundation, Inc., membership fees, and future projects and activities. The group voted an interim set of officers for the year May 2003 to April 2004 which consisted of D.A. Madulid (President), P.A. Cordero, Jr. (Vice-President), Teodora Bagarinao (Secretary), Reynaldo dela Paz (Treasurer), and . Regional Coordinators were also elected to take charge of membership ( R. Lagat, Luzon; L. Liao, Visayas; and V. Amoroso, Mindanao). Madulid being the Focal Point (one of the three) in the Philippines for the Global TAxonomy Initiative of the Un Convention on Biological Diversity presented the latest developments in Asia and the Philippines with regards to the implementation of GTI. He encouraged the ASBP to take a major role in the implementation of the GTI in the Philippines.